The enduring pain of child loss is the daily realization that, even though the event happened in a singular point in time, the loss continues every day. There is no past tense when it comes to your child’s death… You are always losing that child over time. Time robs the grieving parent, an imperceptibly small amount everyday, of the smells, feelings and emotions of what it was like to have them in your life. There is so much about Rees’ brief life that I have already forgotten or tucked deep away in a corner of my mind. It pains me to think that everyday finds myself losing just a little bit more of those memories of what it was like to have him with me. I have tried so hard to hold onto everything I can of slightly less than two years worth of memories I have of him. I have failed. I am failing. I need to focus on the big picture now. I know there are moments in Rees’ life that I will simply never forget. Those are the moments I need to hold on to and embrace. Moments like the night before he died… I remember almost everything about that night. 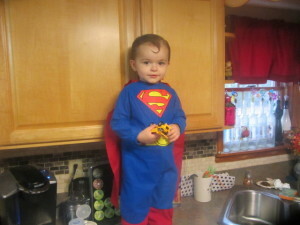 I remember his excitement in putting on the Superman costume for “Safe Halloween” at my wife’s school that evening. I will never forget how it was almost impossible to get the costume on him because he wanted to just fly away the second he saw it. 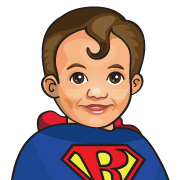 I used to play “Super Baby” with him all the time, flying him around the house – zooming around up and down, Rees squealing with glee. He was more than familiar with Superman, my favorite super hero, than just about any other figure outside of Mickey Mouse. His eyes lit up when he saw that “S” shield and I think he really thought he was Superman when the costume finally found its way on him. It may sound silly, but I was so proud to be his Daddy that night… seeing him wearing the costume of my favorite hero, and his obvious joy at doing so, just made my heart smile. I remember walking around with him on my shoulders; Rees with his arms stretched out like he could fly, just like his Daddy’s favorite hero could. If I had to choose a last moment of happiness with him, I really could not have come up with a better way to spend my last night with him. My little boy dressed as Superman was pure joy; Plain and simple. “What is with your fascination with Superman?” – I get asked that question a lot now. Why is Superman my favorite hero? The answer often surprises people. It’s not his strength, his ability to fly or the other powers he has that fascinates me. The reason Superman is my favorite is because of what he chooses to do with that power. In reality, Superman could have anything he wanted in his world. He could take anything he wanted and never face any repercussions. Someone with Superman’s power could dictate to the world his vision and enforce it with impunity. Superman could easily do all this and more, yet, despite his great power, he chooses to live a life as a mild-mannered reporter and use his powers for good. Superman is the ultimate figure of true kindness: He gives and gives and never expects anything in return. Why Superman? Because he represents the best of us. He represents what we can all be if we try. Superman isn’t super because of his power. Superman is super because of his restraint. 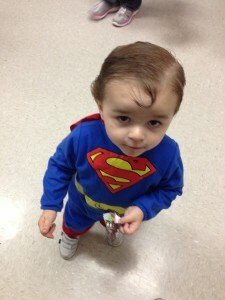 In many ways my little boy is really just like the costumed alter ego of Clark Kent. He is larger than life, represents something bigger than himself, and is a source of inspiration. The reality is that Richie is now a symbol of the power of kindness and his legacy is something that will inspire others to hopefully keep cultivating it worldwide. Like Superman, he only exists now in the hearts and minds of those who his story has touched. He is a symbol of the power of love to conquer the finality of death. I have been so afraid of losing the memories of him that I failed to realize that there are some things I will never forget – and, perhaps more importantly, his story isn’t done being told. Every little boy dreams of one day being a super hero. I vividly remember 9 year old me having a conversation with my cousin that I thought that one day I was going to be a real super hero. It turns out that 9 year old me was wrong. 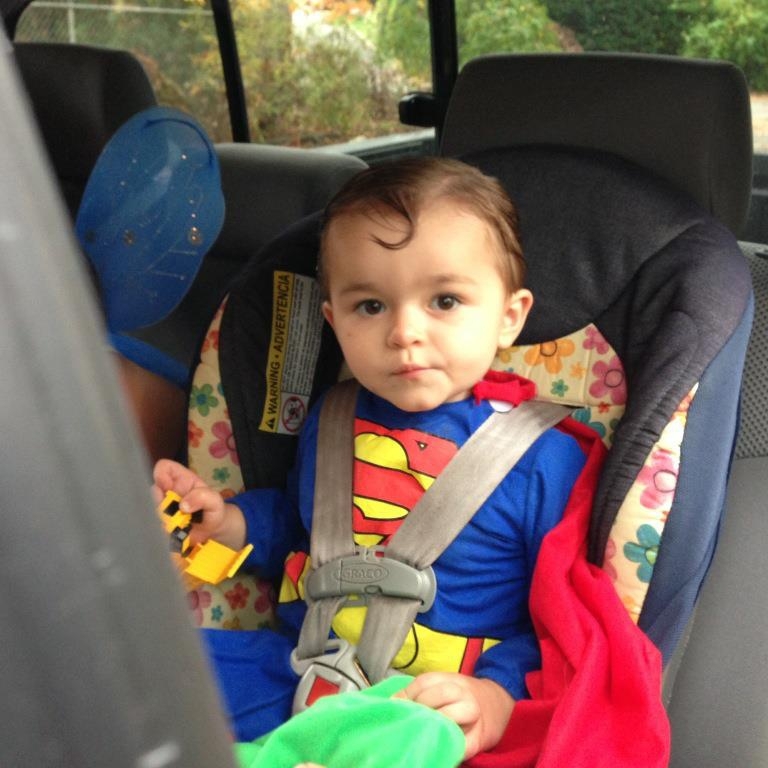 I never grew up to be that super hero, but my little boy did. My little boy is an honest to goodness Super Hero to the countless children who are introduced to him through my book and our foundation. While I may be losing some memories of my little Richie every day, the big picture will never fade. The reality is that he will always be a hero to me and to others. His memory is fueling a groundswell of kindness that is making a little difference in this world, one piece at a time. What more can a real Super Hero ask for than to know they made a difference? I am so sorry for your loss.As a mother of 2 boys, I cannot imagine how you are feeling. I think I would die if anything happened to them. They are 19 and 21, but I have worried and prayed for their safety every day of their lives. I pray for you and your wife to find comfort and peace knowing that your son is inspiring a wonderful movement, and his memory will live on in everyone that is joining this movement. I know it will never ease your pain, but you have made your son live forever with what you are doing. God Bless. I pray for you and yours also. Thank you for your courage to do what you are doing in his memory. May you have comfort knowing that you are comforting others and making a huge difference in their lives.